DESIGNED TO BE used on T&D or Jessel Shaft Style Rockers. 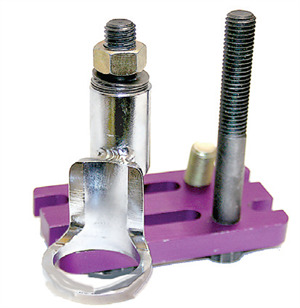 This tool easily adapts from 12º to 23º Heads. Its design pushes the Spring down uniformly so taking out and putting in the Retainer Valve Lock Keepers is easy and leaves both hands free to do the job correctly. Made from Billet Aluminum and Chromoly Steel. This is truly a great tool! Built to last a lifetime. Comes With Complete Operating Instructions Too!